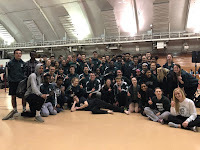 On Friday night the JMM Track & Field competed in its first varsity invitational of the outdoor season at the Watertown Invitational at Watertown High School. The sun was out and the temperatures were decent for an April evening. The competitors battle strong winds at the beginning of the meet that settled down for a perfect night as the meet carried on. Both boys & girls teams took steps forward tonight with 13 athletes setting lifetime PRs and even more athletes achieving season's bests. We look to take the positives from this meet and continue to build into our busy season in the coming weeks. As athletes we ask each and every one of you to utilize every day to make yourself and your teammates better. The boys team managed 43 points for 8th place and although they did not have any individual winners they scored by 13 different performances. The boys were led by 3 third places finishes by Jake R in the 3200m run with a lifetime PR of 9:59.13, Hunter P in the high jump clearing 5' 8", and Ryan B in the discus throwing 130' 0". Other boys scoring included: 4th place by Jeremy G in the discus in a new PR of 128' 9", Micah P leaping 19' 0.5" for 5th in the long jump, Ryan B taking 6th in the shot put throwing 43' 5.5", Bryce H finishing 6th in the 3200m run in a lifetime PR of 10:06.23, Jake A earning a 6th place in the 100m dash in 11.74, Micah P placing 7th in the 110m hurdles in 16.42, the 4x100m relay team combining to run a 45.85 for 7th, the 4x800m relay team of Ben B, Jeremy G, Josh B, & Zach H taking 8th in 9:05.86, the 4x200m relay team combining for 8th in 1:37.83, and Jared B taking 8th in the 100m dash in 11.83. Some other notable PRs on the day came from Jonas B in the 1600m run (5:07.37), Anthony H in the 400m dash (54.65), Alex A in the 400m dash (56.23), James H in the 300m hurdles (47.69), Drake S in the 300m hurdles (47.74), and Josh B in the 800m run (2:11.45). Keep up the great work as a team and good things will happen. Busy week next week with hosting Sun Prairie on Tuesday, Frosh/Soph meet on Thursday, and varsity competing at Baraboo Relays on Friday. Another great week to make improvements. Some athletes might compete in all three meets...get ahead on your school work so you can be a part of this fun final stretch run over the next month. Big things lie in waiting for both the boys & girls teams.